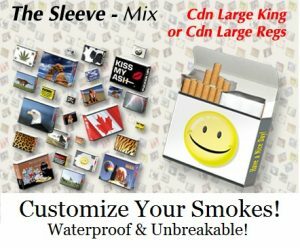 Banned in the stores, The Sleeve is an amazing waterproof slip on cover or case for cigarettes that will reduce your smoking and can be changed in a flash to suit your mood or outfit. Both CDN & US Sizes. Go to “Shop” to see them all… Only $1 each. The Sleeve was originally designed to cover up cigarette advertising, protect your cigarettes from damage (rain, spilled drinks, crushing, dogs, etc. ), and be beautiful at the same time, so only you would know your smokes, which also helps prevent theft. As a side effect the Sleeve has been found to reduce a smokers habit (out of sight, out of mind), in some cases by $50 a month for a pack a day smoker, and was also found to hide them from the sight of children. This is why big tobacco blocked them from the stores. Read below. The cigarette companies blocked this product from the stores, because it works. The stores and distributors have been told that if they carry this product their cigarettes will be taken away. We have been fighting the cigarette companies threat tactics for years, to no avail. You’d swear we were selling explosives when we approach the retailers. Read how The Sleeve works. We have 30 years of research and thousands or customers to back up our claims. If you want to prove it to yourself, it is quite simple…just count the amount of cigarettes you smoke for a week, then cover them up with a picture. Be it a family pic or just a scenery shot. Get rid of all cigarette packaging from sight and then count your smoking for another week. You will notice that your cigarettes are much harder to find. That is the cover working for you. You are only smoking because you wanted one, not because you were tricked into noticing the package. You might also notice your kids will think you quit smoking, because they are not seeing the package around anymore. Studies have shown that if you hide cigarettes from the sight of kids that 1 in 4 will not pick up the habit. The cigarette companies do not like this at all. To keep up the savings you have to change the look of your package at least once a month or you will get used to what your smokes look like and after a short while you will start to notice them more often, resulting in more cigarettes smoked. It is quite simple and it is true. Check for yourself. The problem with homemade covers is that they take time to make and don’t last very long, and you have to make quite a few because of this. The Sleeve on the other hand, is made of a heavy duty polymer and lasts for years and you only need a few to do the job, and at only a couple of dollars they pay for themselves in a few days. Remember though, if you are a smoker that always keeps their package hidden in the first place, then the Sleeve will only be good for a waterproof protector and personalized cover, which is pretty cool too. We know that you will love the Sleeve, everyone who has ever used one does. The only place you can buy this product is here. Even if we do not make your size, each order comes with a cut out for an inner slide that you can transfer your cigarettes into, making The Sleeve the most awesome case you ever had. We ask that you share us on facebook or any other social networking site you might have. Facebook will allow nicotine gum (such as Zonnic) sold in variety stores to be marketed, but not our product. Go figure? This product is so durable we have customers still using theirs 10 years later. We would like to make more but without your help and support I’m afraid they win. We need you to spread the word on social media. When you try The Sleeve, and why not, you will see that this is a solid product that lasts and lasts, you will not be disappointed. We have never had a return. We ask that you post your results on our Facebood page as well. It’s too bad that the government doesn’t see the value of this product on peoples health, but the truth be told, they do. They make more off the sale of tobacco than the cigarette companies do, and do not want any product on the market that reduces those sales. They could not care less about your health or the health of the children all they care about is money. Cigarette package warnings are designed to make you smoke more! They will tell you that The Sleeve covers up the warnings but the truth of the matter is, the warnings are designed to make you notice the package far more often than you normally would, which causes you to smoke more. This is their best kept secret. They know the effect that the warnings have, they design them to do it. We have spent 30 years studying the effect of cigarette packaging and the warnings on smokers and their children, but all of our research falls on deft ears. We send our research to the anti tobacco people and the government but it all comes back unopened. There is no more than 3000 of any one of our available designs left in stock, so get yours while you can. It is really too bad. This is an amazing product that anyone who has ever had one will attest to. They come in US and CDN sizes. We are clearing the stock out at $1 each with a minimum order of 3 to 12 sleeves at a $2 shipping charge. You may buy a box of 50 for $0.50 each with a $5.00 shipping charge. Total $30. We know that you will love this product, and we hope you will use them in good health. The trick to using them is to alternate them at least once a month, otherwise you will get used to what your cigarettes look like and your habit will go back to where it was before. It’s that simple and that easy. Thank you for all the years and support and may good health be yours. The Canadian 25 sizes can be used as a waterproof box for almost anything. They come with a cut out for an inner slide and can be used for money, licences/insurance, candy, fishing lures, change, or any number of things you might wish to carry in them. They are the perfect size for the pocket or glove box and the look can be changed in an instant.